Summary: Solving the “Unable to open the service” error. I've tried to install the Zoo on a Windows 2008 Server and have problems with running the Zoo console. 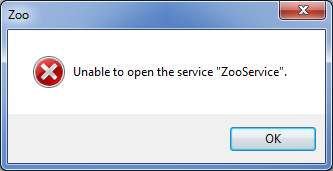 When I double-click on the Zoo shortcut, I get a Unable to open the service “ZooService” error message. On a Windows 2003 Server, it is working fine. The Zoo console is able to start and stop the Zoo service. Zo you have to have administrative privileges to run the Zoo console. Newer Windows operating systems, such as Windows Vista, Windows 7 and Windows Server 2008, have User Account Control (UAC). This is a new feature that helps prevent malicious programs from damaging a system. To run an application as the administrator right-click on the program file or shortcut and pick Run as administrator.